Everyone loves to dance the Locomotion!!! Now you can enjoy the cup song at the same time! 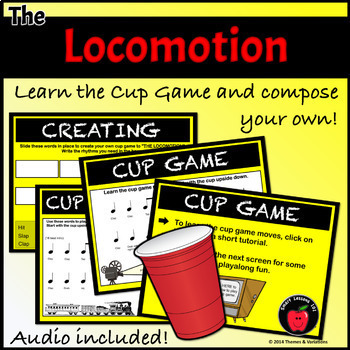 The Locomotion Music Games includes rhythm activities with rhythm stick lessons, cup song composition and the cup passing game to the Locomotion! 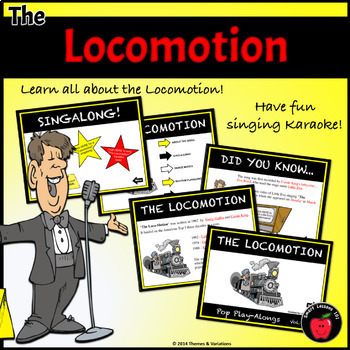 Learn Locomotion trivia and sing some Karaoke! These no-prep powerpoint music activity lessons are a great way to practice reading rhythm flash cards in your elementary music class! 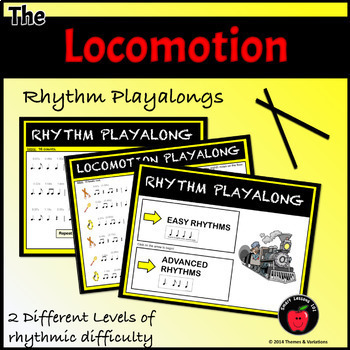 An excellent way to improve rhythm reading and coordination. This product is perfect if you're looking for fun activities for a dance lesson plan or a fun cup passing game for your students! Perk up your Music and Movement or dance unit with the rhythm stick play along! Also works as a fantastic icebreaker or back to school activity. 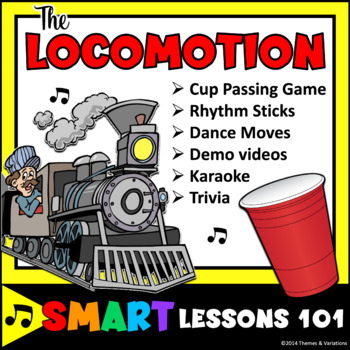 The Locomotion Music Game, cup game, and rhythm stick lessons work well as a group activity or a quick sub plan. Add it to your sub tub or set up as a music center. This product is perfect for small group work or large class engagement and will reinforce musical skills needed for movement & dance, singing and performing music. Click HERE to be the first to see new products and FREEBIES and learn about upcoming sales! The Chicken Dance Cup Games, rhythm playalongs & more! MUSIC THEORY MEGA BUNDLE - Videos, reproducibles & assessment. Complete Smart Theory Program!! THE STAFF MUSIC THEORY BUNDLE - Videos, reproducibles & assessment. MEASURES and TIME SIGNATURES THEORY BUNDLE - Videos, reproducibles & assessment. TREBLE and BASS CLEF NOTES THEORY BUNDLE - Videos, reproducibles & assessment. Want to get Free store Credits? Go to “MY PURCHASES” and click on “PROVIDE FEEDBACK”!